This book is one of the most important books that you will read this year, perhaps even in your lifetime. In The Word of God in English by Lee Ryken, valuable and timeless principles are exposed that will help you to choose a Bible translation that is true and faithful to the original text. In this book, Mr. Ryken clearly and concisely exposes the flaws with modern Bible translations, or at least the dynamic-equivalent translations. 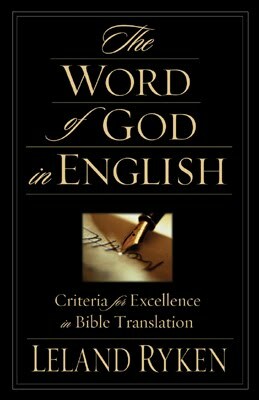 Mr. Ryken is an advocate of word-for-word translation, and in this book he explains why dynamic euqivalent translations fail as a good translation of the Bible, and also clarifies several misconceptions that readers and translators have of the Bible. The book is divided into five different parts, and actually is sorted in a very clear way. The first part is called ‘Lessons from Overlooked Sources’ and covers lessons about Bible translation from history and from modern literature. The next part is entitled ‘Common Fallacies of Translation’, and the author covers wrong assumptions that translators have about readers, translation, and the Bible. Next he dives into ‘Theology, Ethical, and Hermeneutical Issues’. This is where he begins to get a bit technical, and where you’ll need to put your thinking cap on. And fourth he examines ‘Modern Translations: Their Problem and the Solution’. This is a great section where he shows the shortcomings and pitfalls of modern translations such as the CEV, REB, the Message, and the TNIV. And lastly, he examines what a good translation would ideally be in ‘Criteria for Excellence in an English Bible’. Part one is the beginning of the book, obviously, and it grabbed my attention right away. The author begins by saying that like a good book, we have high expectations of the Bible when we read. Dickens wouldn’t be Dickens if someone went through his entire book and changed things and made it easier to read. It’s the same with the Bible. Similarly, the text of a book does not read as well when it has been tampered with by someone other than the author. The author proves that exact wording is important in all sorts of everyday discourse, and this must naturally carry over to the Bible as well. Part two analyzes many different fallacies in translation, beginning with five fallacies about the Bible. The author points out that the Bible is not a simple book, that the Bible is not a modern book, and that the Bible does not need correction. He also points out fallacies about translator’s belief of modern readers: Bible readers are not low educated but are higher educated than people who have read the Bible in the past. And the Bible is not primarily read by unbelievers, but Christians. Through these and many other points, he shows the fallacies in the dynamic-equivalent translators’ ideas and thinking behind the translations. The next part is where the book begins to get a little tricky and where you might have to have a dictionary or something handy to understand it. The author makes a strong case for the authority of scripture, and says that when the translators of dynamic-equivalent translations make such large changes to the original text, their actions are saying that they do not believe in the authority of the Bible, even if they claim that they do. This book was absolutely amazing. I had been reading the NIV in my daily devotions, but after reading this I think I’m going to switch to the ESV or RSV. The author made such a good case for the true to the original translations that I feel like I’m being cheated if I continue to read a dynamic equivalent. I feel like I’m not getting the full Bible when I read it. And the many examples in the text showed me that the NIV, and other dynamic-equivalent translations, aren’t true to the text? How can we truly study God’s word when what we’re reading isn’t even God’s word? And I really would like for you to read this book. As a matter of fact, I’ll make it easy for you. The book is available as a free PDF download at the bottom of the page (provided by Crossway Books) and I highly recommend for you to download it and read it. It’s worth it! Especially if you are currently using a dynamic-equivalent translation, this book will give you a passion to read the Bible in a version that preserves the original text as much as is possible. Seriously, I cannot stress enough that you read this book. It is amazing! My mother first recommended this book to us, and like Andrew did in the review, really stressed that she wanted us to read it. I myself haven’t gotten around to reading it yet, but once I finish Return of the King and get a review up, I have one more series on my reading list before I get to it. But because of this review I may slip it in next. This review caught my interest. I firmly believe that we need more teaching on this subject; there is just too much confusion due to a growing emphasis on “easy-to-read” and simplification. I look forward to reading it and finding out what exactly he has to say about the translations.